Featuring relaxing NaturalCalm™ aromas, Johnson's® Baby bedtime bath forms part of a nightly routine that can help baby to sleep better. 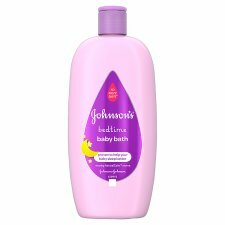 With a No more tears® formula, Johnson's® Baby bedtime bath is mild and gentle on the eyes. To use: Add to running water and swirl by hand in baby's bath. Gently lather, rinse, dry and snuggle.